SORRY! THIS OFFER HAS ENDED. For a limited time, you will receive bonus items when you purchase the following items. In order to get the bonus items, you MUST order off this web page. If you order off the normal web page, you will not receive the BONUS GIFT items. 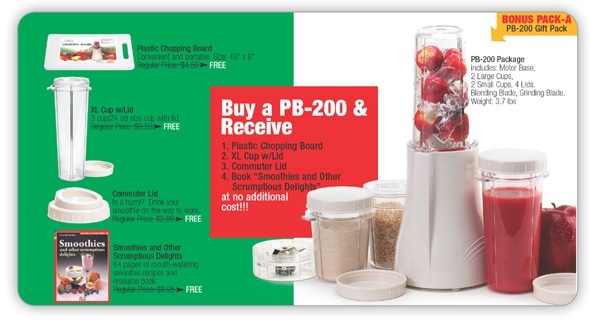 Buy a Personal Blender PB-200 for $79.99 and get $25.94 in gifts FREE! To get the Gift Pack, you MUST order from this page. 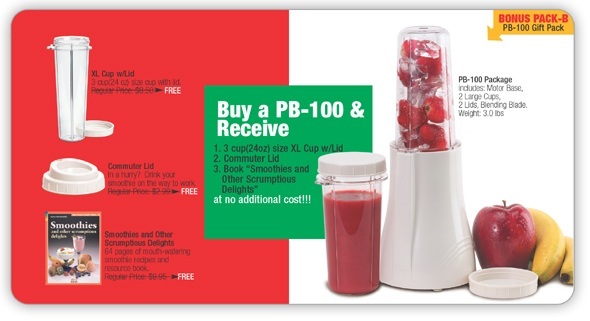 Buy a Personal Blender PB-100 for $59.99 and get $21.44 in gifts FREE! 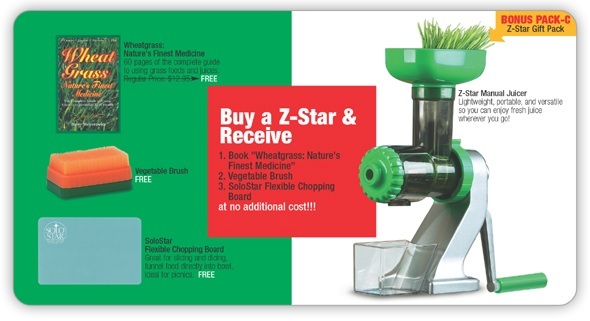 Buy a Z-Star Juicer for $79.99 and get $20.93 in gifts FREE! 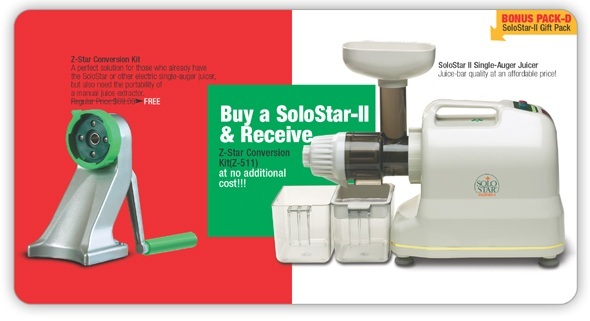 Buy a SoloStar II Juicer for $259.99 and get a $69.00 value gift FREE! To get the Bonus Gift, you MUST order from this page. 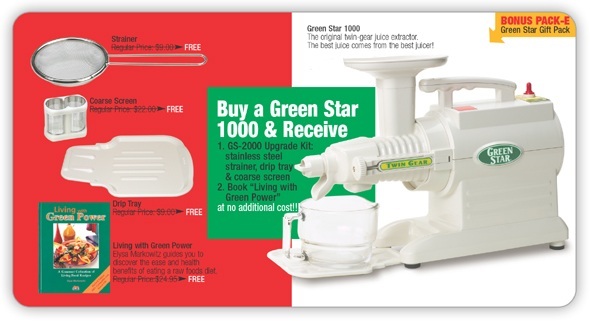 Buy a Green Star 1000 Juicer for $359.99 and get $64.95 in gifts FREE! 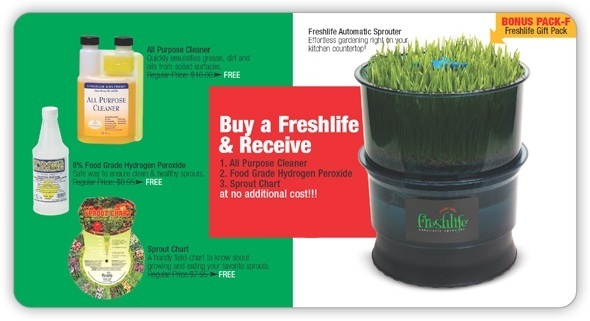 Buy a Fresh Life Sprouter for $89.99 and get $26.90 in gifts FREE! 2. This offer may end at any time sooner than above dates without notice. 3. You must order off this web page to get these special Gift Bonus Packs. 4. If the item is returned, the gifts must also be returned. 5. Our Flat Rate Shipping will apply on all these special Bonus Gift Pack Orders. 6. This offer can be combined with our regular inventory items. 7. This offer can not be combined with our clearance items, which must be purchased separately. 8. The gift pack offers are not valid to orders that have been previously been placed. 9. Orders for the above items from the normal item page, will not receive the bonus gift pack.